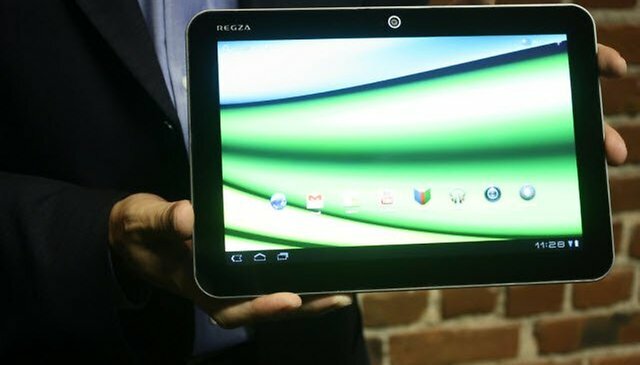 Toshiba's/Acer's New 10 Inch Android Tablets = Another Apple Lawsuit? Toshiba showed off its new 10 inch Excite tablet at CES this week, and at just 7.7mm and 535 grams, it's safe to say that it's now one of (if not THE) the lightest and thinnest tablets in existence. Acer also unveiled their new A200 tablet as well, and I have to admit they are both pretty easy on the eyes. But after looking at the photos, they made me immedietely think about another tablet that looks very similiar from form factor (don't all tablets SOMEHOW look the same? ): The Samsung Galaxy Tab 10.1. And that thought let to another thought: "If these fine looking tablets even remotely resemble Samsungs (which isn't a bad thing), doesn't it just set them up for a legal battle with Apple? If you all recall, Apple sued Samsung over the Galaxy Tab 10.1, saying that, and I quote "It's no coincidence that Samsung's latest products look a lot like the iPhone and iPad, from the shape of the hardware to the user interface and even the packaging. This kind of blatant copying is wrong and, as we've said many times before, we need to protect Apple's intellectual property when companies steal our ideas“. I'm not even going to get into that now, as I have some pretty strong feelings about how any company can say "your're not allowed to build a flat tablet that looks like a tablet“, but it did make me wonder if Toshiba/Acer has took what could happen into consideration. Could it be that form factor wise that they feel "safe", or could it be that they simply don't care? Apple did manage to get the Galaxy Tab 10.1 banned in Germany (and Austraila for a short period of time), and if they had success in doing that, why are Toshiba and Acer so confident that a similiar fate couldn't await their newest unveilings? I for one think that Toshiba and Acer are pretty freakin awesome to do what they are doing. I mean, while there are some similaries to the Galaxy Tab and iPad (they are both square and have a screen), Toshiba has managed to not only produce the worlds thinnest and lightest tablet, but to also include a micro usb, hdmi port, and micro sd ports. This could possibly be the argument that could stand up in court to differentiate the devices if Apple DID decide to play the "hey! That flat tablet that looks like a tablet can't look like our flat tablet that looks like a tablet“ game. What do you guys think? Another lawsuit waiting to happen, or are the courts finally fed up with the childish games? It has rounded corners too, obviously they took that from apple. I cant really tell just from looking, but it does look like it could be a bit on the slippery side. Light is good, thin is still a question for me. I have to have the thing in my hand to tell. Some devices that are extremly thin feel like they are about to slip out of my hand. Does it have a rubbery soft back or is it slippery? I have gotten used to my GalaxyS2 but at first I always thought it is about to slip off into yonder.